DEACON Liam Ryan reckons the Panama Canal is an impressive engineering feat, just as God’s creation of man is a feat of love. “It is just an amazing piece of ingenuity really,” 31-year-old Deacon Ryan said, surveying passenger vessels and giant container ships passing through the canal locks. He visited the canal during last week’s World Youth Day in Panama, accompanying 250 youth pilgrims from Neocatechumenal communities from across Australia, including Western Australia where he has studied at the Redemptoris Mater seminary, Perth. 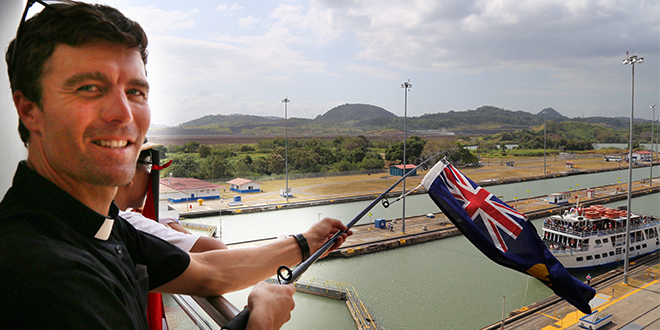 The 80km-long Panama Canal is one of the world’s seven engineering marvels. It connects the Atlantic Ocean with the Pacific Ocean and is a conduit for world maritime trade. “It shows we are capable of working together,” Deacon Ryan said of the building and operation of the canal, which is Panama’s economic lifeblood and makes it stand out as the country in Central America with the highest living standards. Deacon Ryan said the canal project, which required co-operation between many nations, has given modern Panama a chance to flourish. “We know the problems in Central and South America, and this (the canal) is one thing that has allowed the countries to flourish,” he said. Deacon Ryan first travelled on a WYD pilgrimage in 2005. “So I’ve seen the faithfulness of God amongst different generations and I’ve seen the flourishing of the Good News, and continued to see young people be helped by the Church, by Christ,” he said. He described his pilgrimage as “a beauty”, but also not without sufferings and setbacks. “We spent 28 hours in an airport because of flight delays and cancellations, and not much sleep, so physically we are quite worn out but spiritually it’s been just beautiful for me,” he said. “Not always life goes to plan – and in the same way on a pilgrimage God’s always got some surprises. Deacon Ryan said stayed with Catholic host families in Mexico, the first stop of a bus pilgrimage that also travelled through Costa Rica. “Even though we stayed with poor families they treated us like kings,” he said. That experience really got us through and kept us together and was an opportunity for us to bond. “We’ve heard experience of young people – about how they’ve arrived here from different situations, and slowly we learn it is not by chance that God has a plan (for us) and that’s a paradigm for the rest of our life. “We’ve heard a few Gospel readings that have helped me in my life. The communion of the people on the bus, and I see that at the beginning of my own ministry. Deacon Ryan first travelled on a WYD pilgrim- age in 2005, and was inspired to to become a priest.